Yes, I know .. being in 3 hunts in the month of April is insane, especially since I pride myself on making exclusive items for each and every hunt. But when I was contacted by Raindrop Lowbeam, and told the name of this hunt, I could not resist! “Plant This” is a small, grid-wide hunt that is geared toward well .. plants! In the spirit of spring, that is already in full bloom in my real life, and soon coming to other colder parts of the globe, I assembled a yummy garden decoration for your Second Life – the Wheel Barrow with Tulips. A list of vendors, with hints and SLURLS to each shop can be found on the Plant This hunt blog. You can also join the in-world hunt group called Rainy Day Hunts for additional help from the organizers and other hunters. This entry was posted in Events, Freebies and Gifts on March 31, 2011 by moriko. I promised to spam my groups and subscribo members about all the hunts that -Hanaya- is participating in during the month of April. So here is the 2nd of the 3 hunts we are in – the Chez Chic House and Garden Hunt. The hunt has a long list of participants that were all handpicked by the organizer, Hioh Jinx. It begins on April 1st and ends on April 30th, 2011. Hunters will be looking for a small green, white and pink striped teapot. Prizes for this hunt each cost 10 Lindens, but hunters are promised quality, high-end items. The hunt item from -Hanaya- is a custom built greenhouse, with a sculpted infrastructure and awesome textures from Distressed. The greenhouse, complete with planting benches, is 32 prims, comes packaged in a rezzer box and fits on a 10 x 10 meter space. It is set up on display at the ground level of our store (use the teleport pad in front of the store). After the hunt, the greenhouse will be priced considerably more, so get yours during the month of April. The hint for -Hanaya- is “Behind closed doors”. To obtain a list of all the vendors with Landmarks to their stores, or to join the hunt group, click the hunt sign at any of the participating stores. And have fun hunting! This entry was posted in Events, Freebies and Gifts on March 30, 2011 by moriko. I am reporting to you from Plumhill sim in Second Life, currently a beehive of activity as many designers are setting up vendors for this worthwhile charity event, which will open to the public in the very near future. Project Fur Japan is a Second Life fundraiser to help rescue lost animals and give veterinary help to hurt animals from the horrible earthquake in Japan recently. For information about how the effort began and who is involved, please take a look at the Project Fur Japan blog. As I have come to expect, the Second Life community has risen to the challenge of helping. A full region has been donated to the effort by LeLutka. Scores of designers have been busy creating items to be sold, with 100% of the proceeds going to the Japan Earthquake Animal and Rescue (JEARS). Many others have already donated substantial sums to get the effort underway. But you can help too! With all this going on and tugging at my heart strings, I created a set of 4 puppies, exclusive to this fund raiser. These adorable pups are mod/transfer and are only 99 L. So I hope that you will collect them all, for keepers or to trade with your friends. When the sim opens to the public, please come look for us in the purple section. This entry was posted in Events, News on March 30, 2011 by moriko. April is the month for hopping around the grid and collecting some goodies for your Easter basket. 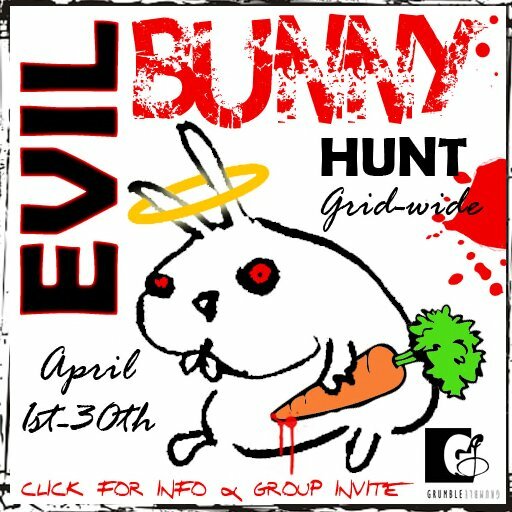 -Hanaya- is participating in 3 hunts, one of which is The Evil Bunny Hunt, organized by Allie Munro of Grumble. The hunt runs from April 1st to 30th, 2011 and has 128 participating stores. -Hanaya- is stop number 31 on the list and is proud to provide a sweet little Easter basket stuffed with sculpted flowers, Easter eggs and the prerequisite bunny rabbit. 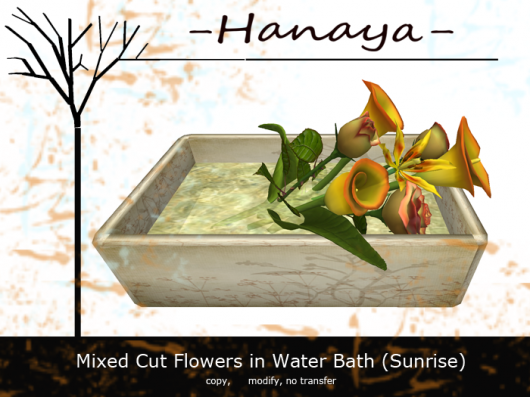 The hint for -Hanaya- is “Eggs, eggs, and more eggs, and flowers too”. The starting point for the hunt is Grumble . A list of participating stores and hints can be found here . You will be looking for naughty or nice eggs – one egg has an angelic halo and the other is a naughty devil horned egg. Check the poster at each location to see which egg type of egg is hidden there. You can also join the hunt group by clicking on the hunt poster. This entry was posted in Events, Freebies and Gifts on March 29, 2011 by moriko. One of the things that my partner Yuukie and I love to do in Second Life is exploring, with camera in hand. A few weeks ago, we had a chance to re-visit the Tableau sim, which has a new look and feel. The build is wonderfully whimsical and the colour palette used is yummy. So naturally, one of my snaps became part of my 3-d art series. The piece is encased in a retro-chic crackled wood frame, and embellished with our ‘Aloe Plant in Square Planter’, sparrows and a broom in case you feel like sweeping the street. It is on exhibit on the second floor of our store in the art gallery. Hang it on your wall and feel as though you are there or visit Tableau in Second Life . Take any old container (or our square organic one) and fill it with sparkling clear water. Both new releases are rezzed at our inworld store, and are also available for gifting on the Second Life Marketplace. This entry was posted in Product Announcements on March 25, 2011 by moriko. The events in Japan over the last week have held us all helplessly glued to sources of information, hoping and praying that the next byte of news is a good one, and wishing that there was a way that we could help. 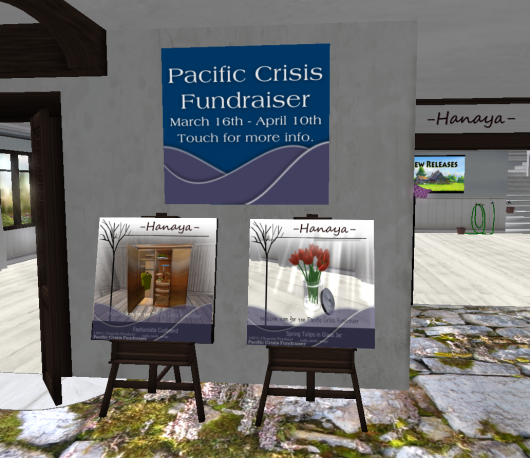 In Second Life, the Pacific Crisis Fundraiser offers residents a way to do just that. An emergency fundraising effort is now underway at the World of Beauty sim, as well as at individual stores on the grid. 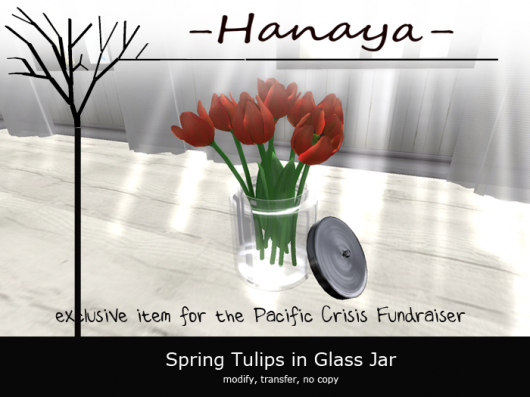 Two items are available from -Hanaya-, and 100% of the proceeds of both items go to the charity behind the fundraiser – Americares. Both items are transfer, so please give generously – buy several of each for you and your friends. This entry was posted in Events on March 16, 2011 by moriko. One of the pleasures of growing spring bulbs and perennials is being able to go out on a dewy morning and cut flowers to decorate the inside of your home. The -Hanaya- Vintage Garden Trug with Flowers is loaded with yummy sculpted tulips, daisies and foliage. I created the sculpt map for the trug based on my fave real life one, so careful of the splinters! The product is copy/mod, and includes an empty version, as well as an embellished version with a delicate butterfly and bow. 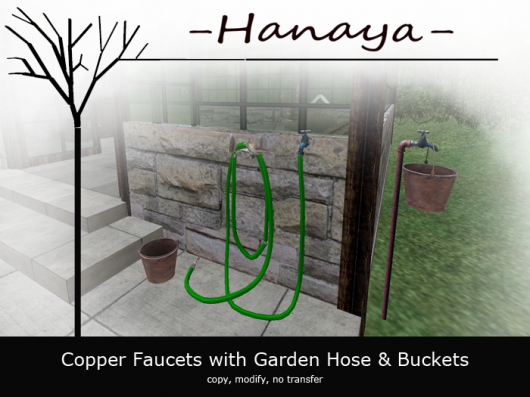 The next new product is one that some of you have been patiently waiting for — the -Hanaya- Copper Faucets with Garden Hose & Buckets. It has taken a bit of time to get this set just right – I pride myself on the realism of my products and the hose was tricky to make. The set includes two versions of the bucket, a standing faucet, a wall mount faucet, a wrought iron garden hose holder with birds, and a sprayer nozzle. Click on the wall-mount faucet to enable water drips 🙂 Again, the set is mod/copy. A separate ‘assemble-it-yourself’ hose kit add-on will be released in the near future. If you have been to our inworld shop lately, you may have seen the donation box for the Water Project, a global fundraising effort to provide access to clean drinking water to those less fortunate. -Hanaya- is participating in The Little Big Shop Fair, which will bring together Second Life stores, artists and the Second Life community to raise money for the Water Project, as well as to encourage designers to share their talents, network, and become both mentors and learners in a collaborative community. The fair will take place from April 15th to May 15th, 2011. This entry was posted in Events, News, Product Announcements and tagged little big shop fair, the water project on March 11, 2011 by moriko. Hello and happy first weekend of March! Are you into old picturesque barns, shabby chic decor, shoes and clothes? 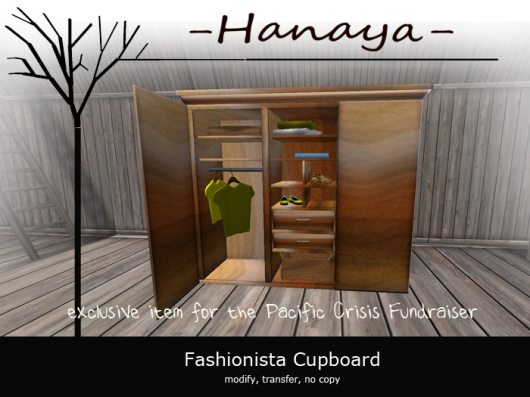 Then you might like our new release, the -Hanaya- Fashionista Cupboard. Stuffed full of sculpted goodies like shirts on hangers, shoes, baskets and stacks of jeans and tank tops, it is a must both as a photo prop as well as a yummy home decor item. The cupboard itself utilizes a sculpt map made by yours truly, and is only 7 prims. Its two compartment drawers and both doors open and close at your touch. The contents are a bit primmy, but are copy/mod so you can rez out as many (or few) as you wish. Also new is matching wall art for our Organic Breezes Living and Dining Room Sets. 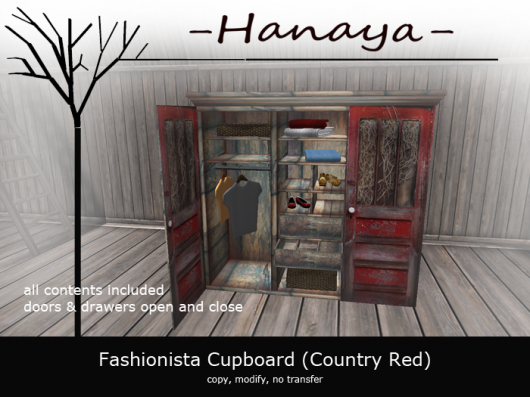 New at the Designers Showcase location only is the empty version of our Fashionista Cupboard . At 99 L and only 7 prims, this ovely clothes cupboard is waiting for you to stuff it full of your dresses, shoes and stuff. Last but definitely not least … some of you may be aware of the privacy issues involving RedZone and other CDS systems. Simply put, these systems scan your avatar without your permission, gather data about you, later making it available to people who subscribe to the service for a fee. I am a vocal opponent of such systems, and have never used them at my store or home parcel. Additionally, these systems (in their HUD form) are not welcome at my store. So if you have one, and plan to visit the store, please remove it before you TP to us. This entry was posted in News, Product Announcements on March 4, 2011 by moriko. 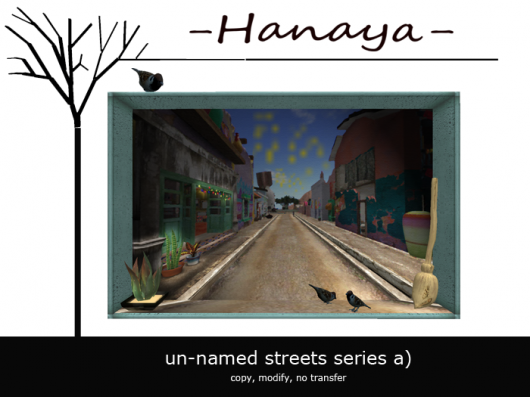 It is the first of March and the -Hanaya- Group and Subscribo Gifts are out. Aren’t I prompt? The group gift is a glass topped coffee table with a bright cheery flowering plant in a ceramic bowl. I based the sculpt map for the coffee table on a real life table that I had in my university days. Just picture my real life one with stacks of books on top as well as on the bottom shelf. The table and plant are 6 prims in total – so hopefully you guys can let it see the light of day, instead of just filing it in your inv. This month’s subscribo gift is another potted plant (the table in the pic below is not included). It was sent out earlier today, so if you missed it please stop by the store, click the subscribo, then choose History and strip it off the notices. This entry was posted in Freebies and Gifts on March 1, 2011 by moriko.